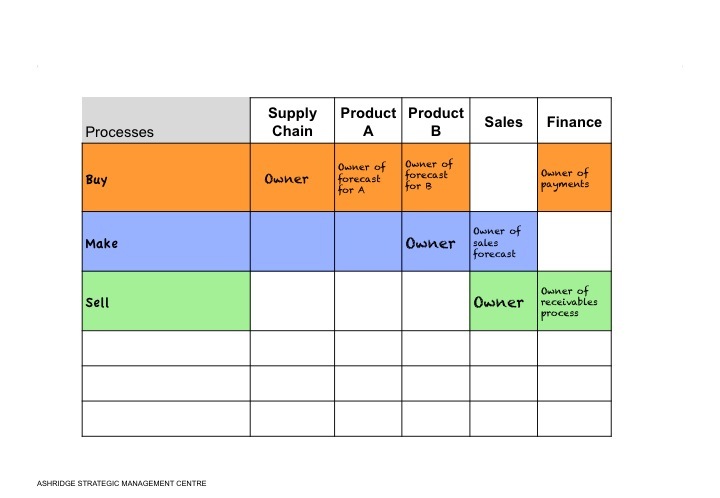 One of the core tools in operating model work is a supplier matrix. The matrix helps clarify why some activities are done in house and others are subcontracted or bought in. It also identifies those suppliers with whom the organization needs to have a carefully designed collaboration. The “collaboration tests” are then a tool for checking that the “carefully designed collaboration” has been well designed! This blog will briefly describe both tools. 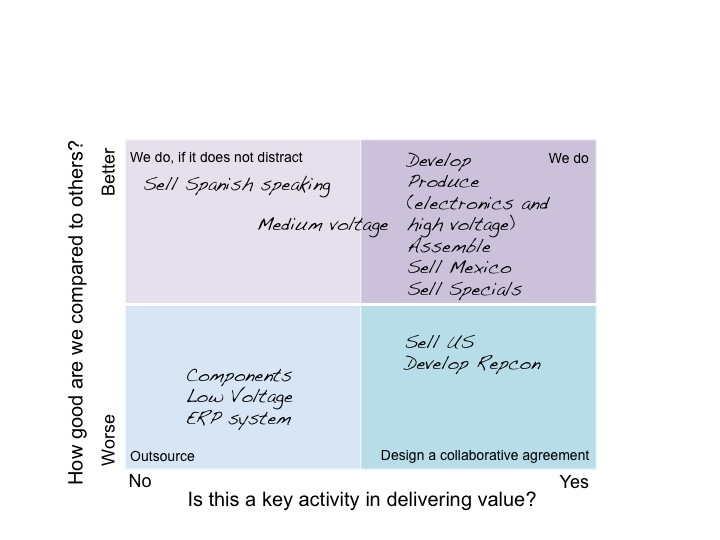 The supplier matrix has two axes – yes it is a matrix! The horizontal axis asks the question “Is this a key activity in delivering value?” and is scored in a binary fashion – yes or no. But the axis can also be used as a scale, with a “maybe” position somewhere the middle. The vertical axis asks the question “How good are we relative to others?” Again, it is scored in a binary fashion – better or worse. But, like the horizontal axis, there can be a middle position of “about the same”. This two by two matrix has four boxes. Bottom left is where the activity is not a source of advantage or excellence and where we are relatively bad at it (costs too high or skills too low). For these activities, the answer is to outsource with a simple contract. Top left is where the activity is not a source of advantage and where we are relatively good at it. For these activities, we can do it ourselves if it does not distract us from more important activities. If it is a distraction, for example because we are short of skills or money, then we should outsource the activity with a simple contract. Top right is where the activity is a source of advantage and we are relatively good at it. These are activities that we should give priority to: they are the core of our reason for existence. Bottom right is where the activity is a source of advantage, but we are not very good at it. This is a dangerous position on the matrix. If we do it ourselves, we are likely to do it badly, and, because it is really important, we may be hurting ourselves or our customers. If we outsources this activity, we are placing ourselves in the hands of a third party who may take advantage of us (demanding high prices) or let us down. We are between a rock and a hard place. The solution to this box on the matrix is to design a collaborative agreement which will motivate the supplier to want to do the best for us and which will still leave us with enough bargaining power to resist exploitation. As you can imagine these are difficult agreements to design. Often they involve joint ventures or special purpose vehicles or pain and gain sharing agreements. Rather than continue this blog on the topic of collaboration tests (tests that help you design good agreements with important suppliers), I will deal with this in the next blog. In response to my recent post on the Process Owner Grid, Richard Rawling responded that he frequently uses a tool called Process Evaluation Grid. 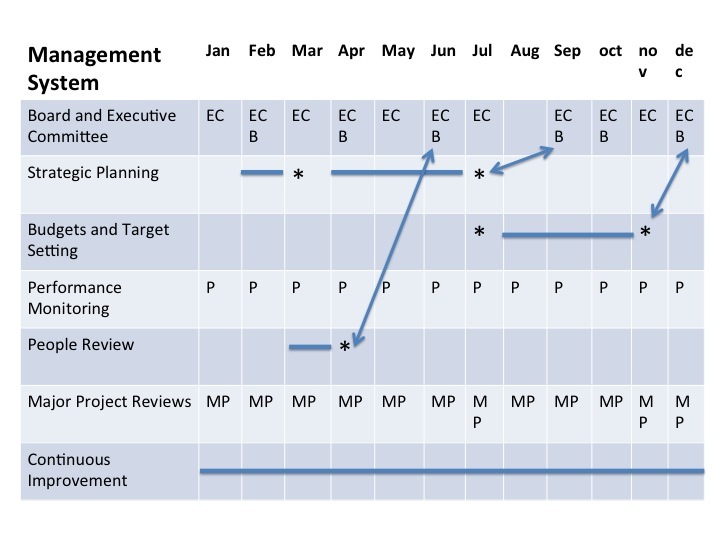 This tool also has the process laid out along the top of the grid – same as my adjusted Process Owner Grid. The difference is that down the side of the grid are listed performance evaluation criteria, such as customer satisfaction and cost – see example from Nous Group. Is the cost of this step, as a percent of sales, higher or lower than that of competitors and why? Is the value that this step creates for the customer, higher or lower than that of competitors and if so why? To do this well, you need to have an idea of the cost of each step, at least in terms of percent of sales; and you need to know where the customer touch points are and what factors customers most value. The Nous Group chart has some other questions on it – which can be selected to suit the issue being examined. It also has the customer touch points and the expectations of the customer at each touch point on the chart, which helps ensure this is front of mind. My first reaction is that the Process Evaluation Grid is more about strategy analysis than operating model analysis, but I can see the benefit of using it as part of a toolbox for operating model work as well. It could be used to back up the value chain map. As you may know, it is often helpful to record “areas of competitive advantage or excellence” and “areas of problem or opportunity to improve” on the value chain map. This helps ensure that attention is directed at the most important steps in the value chain map. 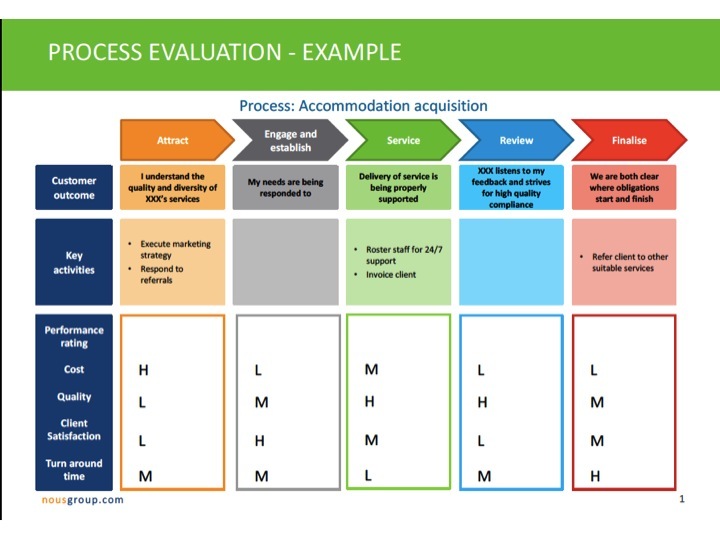 The Process Evaluation Grid is a tool you might use to help you make these “competitive advantage” and “problem” judgements. At my most recent course on operating models, I had an ahah moment about Process Owner Grids. It is better to lay out the grid with the process steps of the value chain along the top and the organization roles down the side – rather than the other way around. In my recent blog on Process Owner Grids, I showed a number of examples with the organization roles along the top and the process steps down the side. As I understand it, this is the traditional way of doing a Process Owner Grid. It follows the format of the Decision Grid. The rationale for this format is that it is typically easier to define an organization role in one word (Finance) or a couple of letters (HR or CEO) than it is to find a short definition of a decision. Hence, given the space constraints at the top of a column compared to those at the beginning of a row, it is best to describe the decision in a few words on the horizontal (i.e. at the beginning of a row) and define the organizational roles on the vertical (i.e. at the top of a column). So a decision might be “define the monthly sales target” and those involved might be “Head of Sales”, “Sales Managers”, “CFO” and “CMO”. The ahah message was that the steps in a value chain are typically laid out horizontally in sequence. 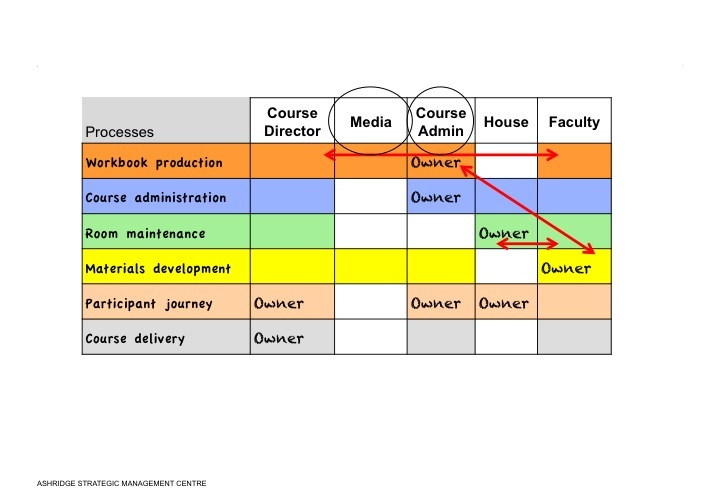 Moreover they are laid out like this in the Operating Model Canvas. So, when thinking about the value chain the mind is naturally thinking left to right rather than top to bottom. So it is most natural to put the steps of the value chain at the head of columns in the Process owner grid. Typically the steps are one word, such as “buy”, “design”, “make”, etc; so they fit comfortably at the top of the columns. The organization roles must then go down the side of the table. The ahah moment occurred because we had drawn up a Process Owner Grid for an example in the traditional way. Then one of the participants, who was only paying partial attention, asked for it to be explained. To aid the explanation, another participant turned the Grid on its side to show his colleague that the rows down the side of the grid were the same as the steps in the value chain. This caused everyone involved to question whether it would not be better to redraw the Grid the other way around. So, from now on, I think I will draw it with the value chain steps along the top. This has the added benefit of being the same way round as the High-level IT Blueprint. So the Process Owner Grid and the High Level IT Blueprint are similar charts/grids. I am ashamed to say that my colleague and co-author Mikel Gutierrez had lobbied to have the Process Owner Grid presented with the value chain along the top in our book Operating Model Canvas – and I resisted because I wanted it to be like the Decision Grid. But I was wrong! Much better for it to be like the High-Level IT Blueprint. There are two parts to what I have been calling a management system. The first part is the management calendar and the second part is the scorecard. This blog is about the management calendar. A management calendar is a timetable of management meetings and events laid out over a year or a quarter or a month depending on the rhythm of the management cycle. For most organizations it is a year. But if you were doing a management calendar for an agile process, the rhythm is typically 6 week sprints, so the calendar would be six weeks. A management calendar can be displayed like a clock or like a table. You have both examples in this article. Please suggest other items. The difficulty in choosing what is part of the management calendar is also partly about deciding what is part of the role of support functions (HR, Finance, IT, etc) versus what is the domain of the leaders. If something is clearly the remit of a support function, such as accounting rules, audit process, IT security, and talent development process, then I think it should be excluded from the management calendar and included in the calendar of the relevant function. So only those processes and meetings that are driven by and led by the top team should be part of the management calendar. This split between functionally driven and top team driven is rather arbitrary, and may be difficult to make in some situations, but it is a way of limiting what is included in the “management system” bucket. The functionally driven items are then considered part of the “organization” bucket in the operating model canvas. So let me give a couple of examples. 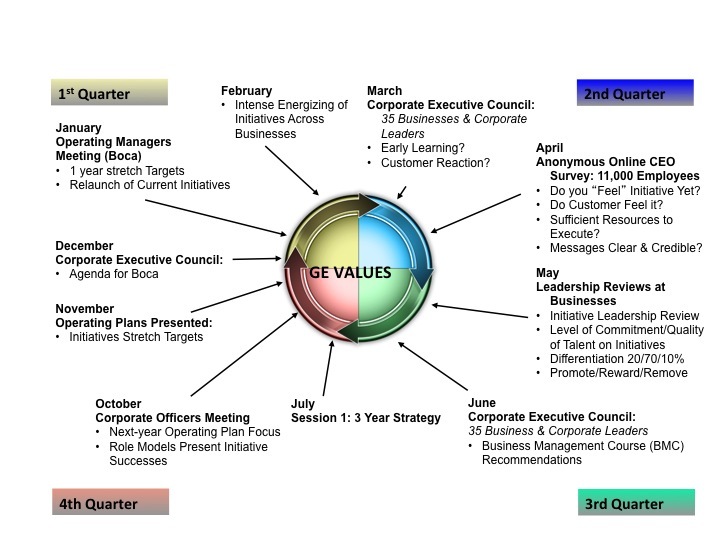 I include one from GE, which is a company that, particularly under Jack Welch, had a very carefully thought out management system. The whole system started early in the year with a management conference in Boca Raton and continued throughout the year with the aim of delivering exceptional performance by the end of the year. The second example is a made up one based on many similar examples that I have seen. It illustrates the importance of thinking through the sequence of events and how they link to the ultimate governance body: the board. The last example I want to mention concerns a British company where the CEO’s main contribution was to drive performance improvement. The whole system started the year before when the CEO would spend time in the trenches traveling with sales people or sitting with engineers. These experiences would give the CEO insights about what improvements might be possible. I remember him telling me that on one of these visits he discovered that on average it took two visits to repair machines that had stopped working. So he calculated how much money could be saved by repairing in one visit, and then included this in his target for that business. He would then set, at the July strategic planning sessions, what were described as “unreasonable targets” for each business for the following year. This gave him 6 months in which to interact with the businesses during the planning and budgeting processes. The 6 months gave time for the management teams to go through denial, anger, and so on, but usually arrive at commitment: a set of numbers they had proposed to the CEO which would typically be close to the “unreasonable targets”. The process then continued throughout the next year with a relentless monitoring of performance within a culture of no excuses: the targets would be met. I don’t have a visual for this process, but it produced remarkable performance for about 10 years and, if I did create a calendar it would need to be based on a two year process initiated every year. “the stakeholders of that person/unit have the ability to reward the person for good work or create pain for the person/unit when the work is not good”. Clearly this is best done directly by the stakeholder interacting with the person or unit, as for a business unit (if the customers are happy they buy more or unhappy they buy less; if the suppliers are happy they deliver on time, if unhappy they deliver late or deliver substandard service, etc). But accountability can also be achieved through the boss of the person or unit: the stakeholder signals to the boss if things are going well or badly and the boss then administers the reward or pain. This indirect mechanism is much less effective, because the boss often does not pass on the reward or pain, or amplifies it inappropriately or filters the signals based on the boss’s own views. The wonder of accountable people/units is that they do not need much external managing. The person or leader of the unit is plenty motivated to get it right. Of course a mission for the person or unit that fits with strategy still needs to be agreed, performance still needs to be monitored, and, when the person or unit is failing, someone needs to be developed or changed. So there is a tight link between management system – planning, budgeting, performance review, people review, risk management, continuous improvement, etc – and organization design. If the organization has been structured into accountable units, the management system, particularly on the issue of performance review can be much lighter. Before I continue, let me just back up and explain why I arrived at this view of accountability. I run a research center at Ashridge Executive Education and we have some important stakeholders – executives who read our research, the larger school, member companies who give us money, participants on our courses, editors of journals, etc. As I was thinking about accountability, I was recognizing that I feel very accountable and I was wondering why. Also, I only meet my boss, the Dean, for about an hour every six months; so I was not feeling accountable because of the management system. I realized that I was feeling accountable because each of these stakeholder has the power of reward or pain over me (I won’t go into the details – but it is because the research center is self-financing). I also realized that success is about doing a sufficiently good job for each stakeholder so that the stakeholder remains engaged with the research center. Of course one of the stakeholders is the mission stakeholder: for us executives of large organizations. For this stakeholder the objective is not “sufficiently good job” but something more ambitious. For the other stakeholders we needed to think about the value we could give to keep them engaged – editors, course participants, member companies, central IT, etc. It is much easier to solve this puzzle if the stakeholder has the ability to communicate directly and powerfully (through their behavior and choices). So one of the difficult relationships has been with central IT. They could create pain and reward for us. But we had no way of delivering value to them so as to motivate them to reward us rather than create pain. I don’t think the Andon cords actually stop the line, but they do signal to management and engineers that they should stop what they are doing and run to where the problem is. This mechanism gives the worker the power to create pain for the engineers and managers. It is this sort of mechanism that creates accountability. In an article I wrote for McKinsey Quarterly, I suggested that one of the ways of stopping corporate headquarters in large companies from being a burden on business units would be to give managers in business units (maybe all managers) the equivalent of an Andon cord so that they could blow a “bureaucracy whistle” when activities by headquarters were time wasting or interfering and the “whistle” would bring senior managers running to “fix the problem”.